A bushy-tailed fox is the latest visitor to Rusty Metal Farm, March 29, 2017. She forgot to close her chicken coop for the night. Just once. She’ll never make that mistake again. The next morning, Elizabeth Dean of Hampden went out to her coop to find that a dozen of her 16 hens had been killed. A few weeks later, Dean spotted two red foxes running around on her property, so she made an educated guess that they were the culprits. After all, foxes are known for snatching up chickens. For centuries, all over the world, this has been a problem for farmers. “Like a fox in a henhouse,” the idiom goes, a phrase that describes a situation where someone has free reign to wreak havoc or exploit a situation. Often characterized as sly and vicious, the fox has been continually villainized in books, cartoons and other forms of media — perhaps by people who’ve lost chickens to their predation. But Dean wasn’t sure. After all, she was asleep when her chickens disappeared. She woke to a pile of feathers and a few lucky hens that escaped harm. She discussed the misfortune with family and friends, who suggested that other wild predators, including fishers, coyotes and weasels, could be to blame. Foxes and other wild animals have always been a problem for livestock, especially chickens, which are small enough to be easy prey for a wide variety of critters. Recently, many of these predators have been thriving in Maine, including the fox. The boom in the squirrel populatio n, biologists believe, is due to last year’s good acorn crop, which also benefited turkeys, deer and other animals that eat acorns. “Something up the food chain, the fox, he’s got a lot more on his menu,” said Maine Game Warden Jim Fahey, who works in the Bangor area. To manage Maine’s fox population, the DIF&W relies on recreational trapping. This year, the season for trapping fox and many other furbearers runs from Oct. 14 to Dec. 31. However, in heavily populated areas such as Bangor, open areas suitable and safe for trapping are few and far between, making it easier for some wildlife populations to rise unchecked. Calls about red foxes made to the Maine Warden Service spike statewide in May, June and July, when fox are hunting overtime to feed their pups. But game wardens receive calls about foxes from concerned residents year-round, Fahey said, and many of the situations are not something a warden can help with. Maine game wardens usually only respond to calls if a wild animal is suffering (such as a deer hit by a car) or is a public health concern (such as a rabid racoon). More specifically, game wardens will not attempt to trap or get rid of foxes that are threatening chicken coops. They don’t have the time or resources to help people rid their properties of nussiance animals. When it comes to protecting your flock, the first step is to make sure to secure your chickens in a solid enclosure — such as a coop — during the night. Foxes and other predators chiefly hunt at night, though they will sometimes hunt during the day when food is scarce or they’re trying to feed their pups. Another way to protect your chickens is by enlisting the help of a guard dog. Webb, who raises meat birds each spring, sometimes leaves her Chesapeake Bay Retriever in the chicken yard during the day if she has to run an errand and leave her free-ranging chickens otherwise unattended. If you see a fox hanging around your yard, always scare it away by making loud noises, such as blowing a whistle, Fahey said. This hazing will temporarily discourage the fox and instills in them a healthy fear of humans. It also will clue you into whether the fox carries rabies, a rare viral disease of the nervous system that is almost always fatal and can be spread through bites and scratches. Foxes are primary carriers of rabies, as are skunks, racoons, bats and coyotes. 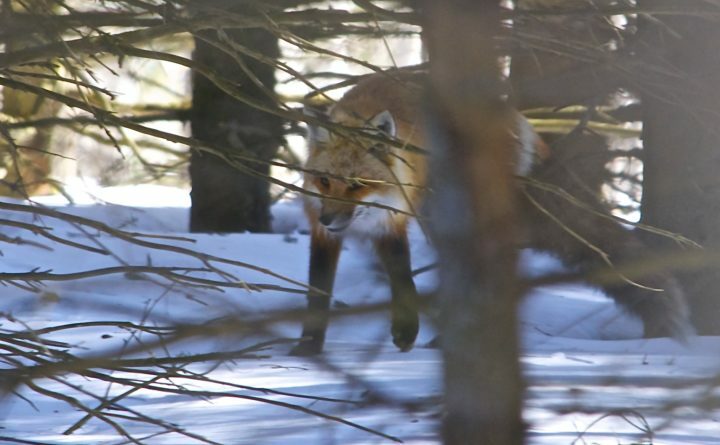 Though Fahey said that often people call the Maine Warden Service concerned a fox has rabies when it actually has mange, an unrelated disease that involves mites irritating the fox’s skin and causing clumps of its pelt to fall out. Potentially fatal in foxes, mange isn’t a public health concern because it can’t be passed to humans. “There’s a lot of misinformation. People see a fox with mange and think it’s rabid. They see a fox and think it’ll attack,” Fahey said. For people aiming to rid their property of foxes permanently, they may have their work cut out for them. Maine law does state that a person may lawfully kill certain wild animals — including fox — found in the act of attacking, worrying or wounding that person’s domestic animals or destroying that person’s property. However, they must then report the incident to the Maine Warden Service. Also, a person who does this must be careful to follow state and local gun laws regarding discharge of a weapon near buildings and public spaces. One option is to hire a local pest and animal control company to address the problem. Another is to create a fenced-in area for your chickens to roam. But sometimes, no matter what you do, you lose a few chickens. And then there’s just one thing left to do, buy some chicks and try again. A few weeks after Dean lost almost all of her flock, she ran into a neighbor who was selling his laying hens at a great price. Even after the shocking disappearance of her last flock, Dean continues to free range her chickens. Letting them wander during the day to eat natural food is important to her. If there’s a predator waiting to pounce, that’s a risk she’ll take.